The new offerings from the iconic brand are all about inclusion. Barbie just keeps getting better! After releasing curvier dolls in 2016 and Barbies inspired by famous female figures last year, Mattel just announced its latest collection, and it might be the coolest one yet. This fall, the brand's Fashionistas line will debut new Barbies with braided hair textures, additional body types and disabilities. Barbie's inclusive new collection will feature a doll with a wheelchair and another with a removable prosthetic leg. Yet another Barbie will have a noticeably different physique with a smaller bust, less defined waist and more defined arms. In other words, Barbie has come a long way from that blond, skinny doll who first made her way into stores 60 years ago and continues the trend of embracing different body types. "We’re always looking to expand our line to be more inclusive. We’ve made great progress and we know there is still work to be done, but we want to offer more options for kids to see themselves represented within our product line," Mattel Vice President of Barbie Design Kim Culmone told TODAY Style. In fact, the newest Barbies are inspired by fans who have increasingly requested dolls that look just like them — scars and all. "Barbie has the power to be part of the cultural conversation around beauty. 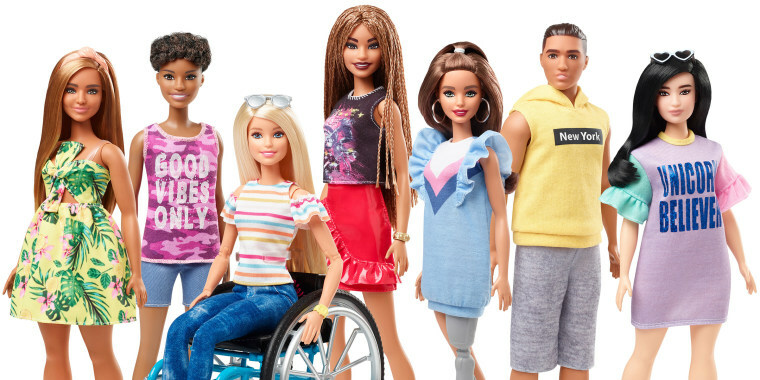 By including diverse looks and representation of physical disabilities into our fashion doll line, we can further showcase the importance of diversity and inclusion to the kids who play with Barbie," Culmone said. Should toy marketing be gender-neutral? When it came time to design the disabled dolls, the Barbie team took their work quite seriously and partnered with the UCLA Mattel Children's Hospital and Jordan Reeves, a 13-year-old girl who has a prosthetic arm. "Hearing feedback firsthand from experts and people who live with physical disabilities was a priority for us and extremely important. Our intention was to capture as many details as possible to create a relatable experience," Culmone said. For instance, while working on the doll with the prosthetic limb, Reeves informed the Barbie crew that having a removable limb would help make the doll seem more realistic. Mattel announces 15 new versions of Ken doll - even 1 with a man bun! "We wouldn’t have known that if we didn’t work with her. We were honored to have both parties involved to bring kids a real representation they will enjoy and play with," Culmone said. You'll have to wait until the fall to score one of these cool dolls, but in the meantime, Culmone wants young and old Barbie fans alike to know this is just the beginning of a new age for the brand. "Our commitment to diversity and inclusion is a critical component of our design process, and we are proud that today’s kids will know a different image and experience of the brand, and that’s progress," she said.